What is the School Council for? We have School Council meetings every week, our School Council members give up their time to attend our meetings. 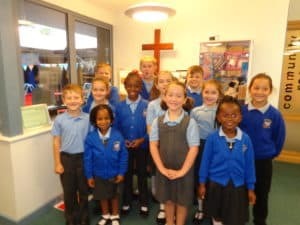 School Council is all about raising money for charities and our school. We like to help people to become healthier and to be safe. We regularly organise school events and we discuss how we can improve different things in our school. Children in need – we had a mufti day in school and we all took part in a sponsored hula hoop. We raised £1497.80! Dog Smart – we had an assembly all about being dog smart for the Dog’s Trust, it was very interesting and we learnt what to do to keep dog safe. Cancer Research – we organised a mufti day, we raised over £200 for this great cause! Road Safety Heroes – School Council were involved in sorting through our applications for the Year 4 & 5 children who wanted to be one of our Road Safety Heroes. Our 4 successful applicants were Kelsey, Jessica, Annie & James. Every week we talk about any school issues, we have a few current things we are discussing. We will keep you updated!